The name says it all: The Big Event. Those who have never had the good fortune to set foot in the Express Ranches Sale Barn have no inkling of the beehive buzzing under the big top. In one corner, eager servers tote trays of tri-tip, biscuits, and brownies to buffet tables where more than 400 will break bread in the next 90 minutes. At the shoeshine stand, cattlemen and their brides queue up two and three deep to have their boots given that like-new look. Lording over the entire affair, auctioneer Eddie Sims barks out bids as the price of a half-interest in an Angus cow and her calf soars past $100,000. Arms folded, eyes twinkling, Bob Funk sits in the middle of this extravaganza. Garbed in true cowman style, Funk’s distinguishing trait is actually his smile. Could it be because he’s chatting with his girlfriend and his son? Or is his contagious grin because friends have flown in from across the country? Then again, there’s a pretty good chance that Funk’s smile might be directly tied to the sound of Sims’s gavel, which just came down at $195,000. At first glance, Funk’s credentials stand out as boardroom caliber, not the sales-barn sort. As the chairman and the chief executive officer of Express Employment Professionals, Funk oversees a thriving organization with more than 550 offices in four countries and projected revenues in excess of $2 billion this year. The largest privately-held staffing company in the U.S., Express Employment is a heavyweight in the human resource industry. Unlike many of its competitors, Express Employment has gained market share during the economic uncertainties of the Great Recession. Through the second quarter of 2011, Express has seen double-digit growth for six consecutive quarters. Since 2009, the Oklahoma City company has nearly doubled in size. Sales are up a robust 92 percent. Given this track record, it’s no surprise that the number of boards that vie for Funk’s time and support is mind boggling. Churches, schools, and even Uncle Sam have come calling. Funk was chosen as a director of the Tenth Federal Reserve District, the seven-state region that anchors the heart of the Great Plains. Initially appointed to the Oklahoma City branch, he then joined the board of directors of the Kansas City Fed, was chosen chairman, re-elected chairman, and, in 2007, selected as the chairman of the Federal Reserve’s Conference of Chairmen. Funk advised the Board of Governors of the Federal Reserve System, including former Fed chair Alan Greenspan and current chair Ben Bernanke. “Don’t go telling too many people that. They might hold it against me,” he says and bursts out laughing. Yet the truth is Funk is equally at home on the range or behind a desk. For that matter, he can hold his own on the altar as well. Few people realize that this civic leader, this rancher and cowman is also an ordained minister who earned undergraduate and graduate degrees in theology from Seattle Pacific University while studying business. His broad range of interests is fueled by a level of energy that can best be described as boundless. During a three-month span this summer, the 71-year-old journeyed to Italy to officiate at the wedding of a close friend, traveled to Scotland to dine with Prince Philip, landed not one but two hundred-pound halibut off Canada’s Queen Charlotte Islands, and escorted the Duke and the Duchess of Cambridge to the Calgary Stampede aboard an Express Ranches stagecoach that was drawn by four of his champion black-and-white Clydesdales. The secret of his success? No matter the venue, Funk applies the lessons he learned from those he loved growing up on the land. These building blocks have led to a series of successes he readily admits he could never have imagined. They have allowed him to make countless acts of generosity. Most of all, they have given him a mission, one he pursues day in and day out: Bob Funk believes it is absolutely essential to instill those same lessons in the hearts and the minds of youngsters growing up today. So it’s safe to assume that Funk grew up enjoying the many activities he endeavors to share with kids across Oklahoma, right? Think again. The mere mention of this older cousin’s name puts a smile on Funk’s face. This tough taskmaster was the wellspring of Funk’s ferocious work ethic. In his barns and on his fields, Funk learned leadership tenets that would build a multi-billion-dollar company. “Adolph Hanish started at 6:00 a.m. and finished milking 60 cows at midnight every night, seven days a week. And he didn’t think that was working too hard. He loved his cows. They were his life. Adolph taught me a good work ethic. So did Dad. Dad just loved to work. He loved the land. He loved his cattle. My dad worked cows at all times, even after he went broke in the dairy business. He spent more money on his cattle than he should have: the best hay, the best grain. After he went to work for the highway department, he still kept some cows. He’d go milk four cows by hand every morning, start his job at 8:00, finish at 4:30, and milk cows until 7:00 every night. And that was just standard for our family. Dad was a hard worker. He was a wonderful man,” Funk says. There are two sides to this anecdote, and they reveal the mettle of the man. Ask Bob Funk about his cousins’ taunts and he dismisses the personal discomfort that every adolescent endures. Instead, he speaks of the journey of a fellow human being. “Adolph was a single man who never took a day off. His whole life was his cows. When I started working for him, he had gone 17 years without a day off. The Fourth of July, Thanksgiving, Christmas — he worked holidays, he worked when he was sick, he worked no matter what. I was glad to give him a break,” Funk says. Ask his sister, however, and another side to her younger brother emerges. “Those boys couldn’t have known it, but what they were doing was challenging Bob. They challenged him to make something of himself, and he sure did,” Joanne says. For some inexplicable reason, cousins have shaped Funk’s life. Hanish, his father’s cousin, helped mold the young boy into manhood. Decades later, one of his mother’s cousins opened a new chapter in his life by steering him out west. Most Americans know Ed Pease for his service as an Indiana Congressman. But in Northern New Mexico, the Eagle Scout is known for his service at the legendary Philmont Scout Ranch. The 137,000-acre ranch is nestled in the Sangre de Cristo Mountains, the heart of the historic Maxwell Land Grant (see “Lucien Maxwell,” Land Report Fall 2008). The grant’s 1.7 million acres had been divvied up into a series of enormous ranches, and some 300,000 acres were acquired by legendary Oklahoma oilman Waite Phillips. It was his bequest that created the Scout Ranch. In 1996, Pease learned that a key inholding was about to change hands. “Word got out that the Atmore Ranch was going to be sold and then cut up into 20-acre parcels. I support a landholder’s rights to do what they see fit with their property, but the idea of walking through a subdivision to get to the biggest mountain on Philmont ruins the concept of hiking through the wilderness, doesn’t it?” Pease asks. Pease knew the clock was ticking. “In all the time I’ve known Bob, I never ever asked him to do anything financial. But this time I had to. I called him and made the pitch. Bob had never been a Scout as a kid. Growing up he was too busy working to have time to be a Scout. There was no reason for him to buy this ranch. But he knew what it would mean to generations of Scouts to come, so he went ahead and bought it,” Pease says. Ten years after acquiring the Atmore, Funk expanded his New Mexico holdings when he bought from Brad Kelley the portion of Philmont that Waite Phillips kept for himself. 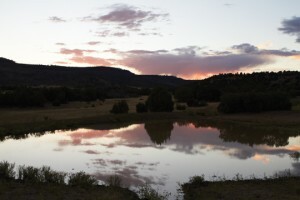 Called the UU Bar Ranch, it is a Rocky Mountain paradise that rises from the high-desert rangeland at 6,000 feet to more than 11,000 feet above sea level in the Sangre de Cristos. Keating’s wife, Cathy, concurs. Like her husband, Oklahoma’s former First Lady has been a regular at the UU Bar since before Funk bought it. 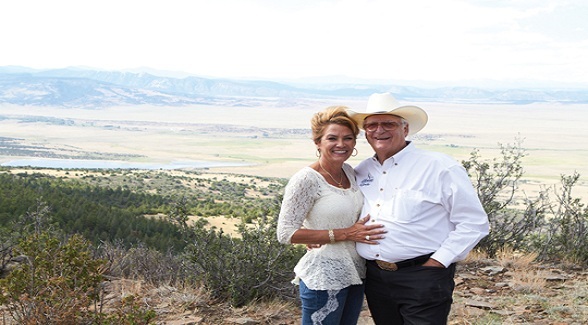 “We’ve been elk hunting with Bob every year since he bought the Atmore. There’s really just nothing quite like that country out there. It’s just a very special place. You’re in God’s country. I love those moments at the UU Bar – the early morning breakfasts at the lodge that Ralph [Knighton] prepares, driving up to the meadows and waiting for the bugling to start. Then you hear the bugling and the thrill of the chase. I really don’t care if I shoot or not,” she says. As memorable as a visit to the UU Bar may be, the vast property is an integral element of the Express Ranches portfolio. This multifaceted beef production entity is driven by one goal: better cattle. On a trip to New Mexico, Funk points out that yearling bulls are conditioned on the UU Bar before being taken back to Yukon and sold. “Jarold likes to tell me we beta test our genetics at the UU Bar,” Funk says, referring to Jarold Callahan, president of Express Ranches. The two teamed up in the mid-1990s when Funk negotiated the purchase of the B&L Ranch and the B&L Angus cow herd near Shawnee from the Oklahoma Cattlemen’s Association Foundation. Up till then, Funk had focused primarily on Limousin cattle. With the purchase of the B&L, Angus cattle became the driver in the expansion of the Express Ranches brand and Callahan was put in charge. “I told Jarold, ‘You sold me these suckers. You come and make them pay,’” Funk says. And that’s exactly what those black-faced cattle have done. 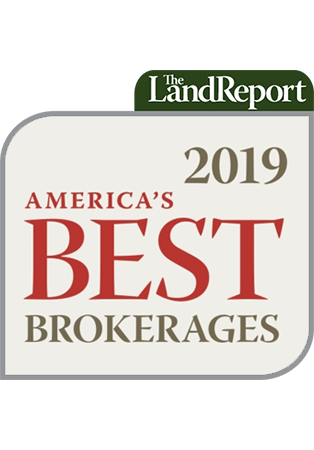 According to National Cattleman, Express Ranches is the nation’s largest seedstock operation. Judging from the strong sales numbers at this year’s Big Event, that ranking is safe and secure. So what does this mean to Bob Funk? It goes without saying that there’s a sense of accomplishment. Back in 1996, he, Callahan, and their team set out to become No. 1, and they’ve done exactly that. It’s the same exact approach that Funk has taken at Express Employment Professionals: putting a team together, setting a high bar, and doggedly pursuing that goal. In three or four years, Express Pros will also be No. 1, Funk tells me. 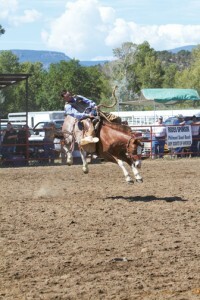 Bob Funk Jr. is also drawn to the rhythm of the cattle business. His day job may be president of the Oklahoma City Barons, but in the back of his mind are lessons he learned years ago. Like his father, he insists those lessons be shared. Both men are passionate supporters of the Oklahoma Youth Expo. 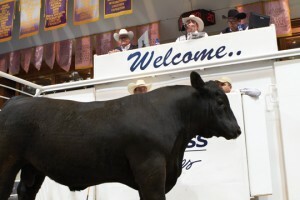 The organization’s director, Jeremy Rich, tells me that thanks to the Funks, the Expo has gone from near extinction in 2001 to the largest junior livestock show in the nation. I think I know why.